In all the hand-wringing over the rising cost of oil and gas it is astounding that there is still the naive notion abroad in the land that somehow our governors will come to the relief of the governed. It’s time that Canadians woke up and smelled the sulphur. It’s not going to happen. The faster we realize it, the faster we might get mad enough and reassert the sovereignty of our suffrage over our lives. Oh sure, <?xml:namespace prefix = st1 ns = "urn:schemas-microsoft-com:office:smarttags" />Ottawa may come in with rebates and other window dressing schemes. But the core issue will not be redressed without responsible agitation by an informed and inflamed citizenry. And our citizenry thinks the issue is price-gouging and collusion between oil companies compromising what is thought to be a fair regulating market. Canadians are wrong. 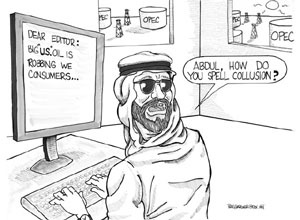 There is no market regulation or anti-monopoly enforcement in the oil industry because the collusion goes much higher and reaches much further. The real issue involves the institutional intimacies of vested interests in big oil and big government who long ago conspired to fix the oil markets to satisfying their mutual greed. It also involves the institutional betrayals of the Canadian commonweal by those same interests who have maintained a facade of benevolence and fair play. There is no fair play. There is only a power play. Before going into the real story behind oil prices, let’s examine what has recently come to light about the current administration in Ottawa. Prime Minister Martin’s most senior confidant, Maurice Strong, was recently dismissed as Special U.N. Envoy for North Korea because of his partnership in a company with suspect dealings called Cordex Petroleum. Cordex had an interesting group of investors through holding companies. They included one Sadaam Hussein. They also included one Paul Philippe Edgar Martin, Jr. That’s how far the tentacles of big oil’s power plays reach. Does anyone in their right mind think that a Prime Minister who compromised due process in this country by setting up the Gomery Commission to smear those who refused to pledge obsequiesce obedience to his administration as well as to deflect from publicity that began arising about his own possible conflicts of interest involving Bombardier, Earnscliffe Strategies and Lansdowne Technologies – possible conflicts that Gomery has no mandate to examine - is about to attack big oil with Cordex hanging like a sword of Damocles. Not on your life. The situation in Washington is no better. The connections between the oil lobby and government are so incestuous and reach back so far that even President Eisenhower warned of it as one of the most serious components of the “military-industrial complex” that he considered the greatest threat to Americans’ independence. The relationships between the Bush administration, the Bush family and oil producers – both national and corporate – are closer than in any previous U.S. government. In Iraq, they are giving away oil leases to three companies totally intertwined not only with President Bush but with Vice-President Cheney. Just last year former U. S. Senator Frank Lautenberg of New Jersey lambasted the President following evidence that Bush agreed to a secret deal with Saudi Prince Bandar bin Sultan to help the President win the election in November. The alleged deal allowed high oil prices for most of 2004 in return for a boost in oil production and lower gas prices in the three months immediately prior to the November election. Lautenberg said, "One must ask why Saudi Arabia has such a privileged position with this Administration. This supposed friend of America has traditionally failed to support us when they are most needed. We put hundreds of thousands of American military men and women on the ground to stop Saddam Hussein from expropriating their land in 1991, but when American soldiers were killed in the Khobar Towers bombing, the Saudi government hindered the investigation." "Now, with gasoline prices going through the roof, the Saudis have decided to cut back on production, making prices even higher. Instead of falsely accusing John Kerry of increasing gasoline taxes, the President should be working to stop this fleecing of Americans at the gas pump." Sen. Carl Levin of Michigan, Chairman of the Senate's Permanent Subcommittee on Investigations, uncovered regular manipulation of prices by oil companies that of necessity would have required government complicity. A startling example was the discovery by Levin’s investigators of internal memos from BP Amoco PLC that set put a plan to "…influence the crude supply/demand balance by offering supply agreements to other oil majors in exchange for refining capacity shutdown and movement of product from the U.S. to warehousing in southern Ontario." When Levin asked Rob Routs, president and chief executive of Shell U.S., whether he was troubled by, "The fact that gas prices go up and down together everywhere almost at once,” Routs replied, "No, it doesn't trouble me at all." Routs replied. Levin suggested that such pricing, while legal, ought to be considered "an anti-competitive act" and that juries should be allowed to consider whether that is an antitrust violation. The retail prices of oil and gas have little to do with open market regulating principles of supply and demand. From the famous Gulbenkian (Mr. 5%) grouse hunt weekend in Scotland the 1920’s that set the borders of today’s Arab oil-producing states through the growth of the “Seven Sisters” oil conglomerates in the 1950’s and 1960’s, the compact between big oil and big government has been renewed year in and year out. They are partners. Regulatory agencies mandated to enforce anti-monopoly and open competition policies turn a blind eye to oil companies. The reason is very simple. Depending on the jurisdiction, 40-60% of the price at the pump goes to government in taxes. But don’t cry for the oil companies. It doesn’t affect them one iota. Just four months ago, when the per barrel price of oil reached $60, there was a hue and cry when gas hit eighty cents a litre at the pump. When the price of a barrel dropped back to $45 just ten days after, there was very little movement at the pump. Where was the pressure from government asking why? There was none. The reason there was none was that government profits more through taking in higher taxes. Officially, Ottawa, as most western governments, backed the pious claims of the oil producers that prices had to be kept high because of the increasing costs of production, diminishing supply, and rising demand. All three claims are false. The price of producing a barrel of Saudi light or Venezuelan crude oil, which together account for almost 50% of world supply, is $3.00 a barrel. That’s right. Three dollars a barrel. In Canada we are close to paying $1.50 a litre and in many American states the price per gallon is now touching $4.00. Even factoring in transportation costs that’s a helluva profit from a production price of $3 a barrel to a market price of $60-$70. For those who have been wondering, one barrel equals 42 US gallons, or 159 litres. Where are the anti-gouging regulators now? Well, they hide behind door No.2. They put out the line to the public that due to diminishing supply, oil companies have to be given a wide berth and prices cannot be controlled or reigned in. But sometimes the truth does get out. The fact is that this year Canada surpassed Iraq as the world's second-largest holder of oil reserves because the Alberta oil sands have finally been taken into account now that its “heavy” oil is now not considered too expensive to exploit. And who claims that they are now not too expensive? The Canadian Association of Petroleum Producers. CAPP Vice President Greg Stringham admitted that oil sands projects are economically viable at market prices of $18-$20 a barrel. Well they’ve been way over that for decades. The numbers are staggering in their discrepancies. The Canadian oil industry has traditionally maintained that Canada’s oil reserves were 4.9 billion barrels. But the U.S. Department of Energy’s International Administrator Guy Caruso stated in his briefing this year that indeed the Alberta oil sands are economically viable and Canada’s real reserves are 180 billion barrels. Iraq’s reserves are 112.5 billion barrels and Saudi Arabia’s are 264 billion barrels. Oil sands development will require drilling assisted by steam-injection pressure or from simple mining. But CAPP's own estimate of Canada's recoverable oil sands is even higher than Energy’s Caruso. CAPP puts the number at 315 billion barrels - 20% from mining and the rest from steam-assisted drilling. Stringham said despite Canada's ratification of the Kyoto Protocol limiting carbon dioxide emissions, the industry expects the international agreement to add only 25 cents to 30 cents a barrel in development costs. Why hasn’t the Canadian government encouraged development in order to bring retail prices down? Because government makes more tax revenue at higher retail prices. And government’s big oil friends want to keep the public image of limited supply alive in order to have higher wholesale prices. Big oil and big government are not colluding to assure reasonable profitability and sustainability in the oil industry. They are colluding to protect the “right” to exorbitant profits, and taxes, fiscal quarter after fiscal quarter, year in and year out. Much has been made of the growing Chinese demand for crude pumping up prices and the natural disasters from Asia to America that have closed refining capacity. The reality is that both these factors have had minimal impact. Closures of refineries from Indonesia due to the Tsunami, to the offshore Gulf installations due to Hurricane Katrina, have been relatively short in nature. They amounted to weeks, not the long-term closures big oil’s spin-doctors warned about. For all of China’s economic surge, growth in world oil demand has remained fairly stable relative to supply. In fact discoveries of new reserves have outstripped growth in demand. Leaving the Middle East, the Venezuelan government estimates that it has enough oil in Venezuela alone to power the world for 44 years at current consumption levels. Add that to Middle East numbers and Canada’s oil sands reserves actual world reserve life is pushed well out into the 22nd century. The oil will not be as cheap as current reserves, but as we have shown they are not prohibitively expensive either. And these numbers do not take into consideration Russian reserves which, even though they are the world’s most difficult and unconventional to exploit, are proven as to quantity and are greater than the Middle East’s. The premise of shortage of supply is, by any standard, a fallacy of staggering proportions and the propagation of this myth by producers and governments is a fraud on the body politic of criminal degree. No examination of the problem of big oil would be complete without a look at the plague of OPEC. Reasonable, thinking citizens should wonder at the apologias constantly offered up for this band of brigands by oil industry and government spokesmen. There is a veritable flood of statements that appear whenever public anger vents its spleen at the cartel. We are constantly told that OPEC is a “stabilizing” factor on the world oil scene. The reality is that the only thing OPEC stabilizes is the ability of producers, refiners and heads of government to cut up the oil pie, and oil policies, in council rooms apart far from the maddening eye of public scrutiny. At OPEC’s founding conference in 1960 in Baghdad, it claimed as its rationale the creation of a necessary counterweight to Western oil interests. But what followed could truly be termed a grand conspiracy. Wave after wave of state oil nationalizations followed OPEC’s founding. But the curious and common element in them all was that the new “state” entities established always had western oil companies as partners. Using the OPEC nationalizations as a cloak, western oil companies continued to provide the operating and managerial expertise for the producing countries and their profits actually grew after the nationalizations. And all this was before the 1973 OPEC oil embargo ostensibly put into effect to protest American support for Israel during the Yom Kippur War. That embargo was just another in a long line of fabrications and excuses invented at every opportunity by OPEC to hike prices. And always with the complicity and acquiescence of its western corporate and state partners. Journalist Bhushan Bahree has chronicled how even the U.S.-led International Energy Agency is now cozying up to OPEC in ways that actually help keep oil prices high. The reason for the complicity has been outlined above. Big oil’s profits grew and big government’s tax revenues grew. Without passing value judgments on the issues of the internal combustion engine, energy waste in the west and greenhouse emissions – all of which will be the subject of a forthcoming paper – it is clear that at current consumption rates, oil reserve life can be measured in centuries, not decades, as producers, refiners and governments try to make us believe. As people concerned about the environment, we may see this as bad news. Oil will remain plentiful long after serious damage from climate change starts to mount. The problem at hand however is how to protect consumers and stop the profiteering and price-gouging that has reached unprecedented proportions. We can’t solve the problem of global oil power, but we can make a start here at home. The first critical step must be public pressure on media to counter the gross misinformation we are fed every day. Even if many reporters do not see themselves as advocacy journalists, they, and their bosses, have a responsibility to correct the dissemination of lies. We deserve nothing less from the Fourth Estate. The "invisible hand" of the marketplace will not come to our rescue. Energy is, in the final analysis, a political matter. As citizens we need to force our elected officials to reign in the voracious appetite of what is quickly becoming an “outlaw” industry operating without restraint of consequence. The Talisman Energy confrontation brought into stark relief the impotence of federal policies. With the reserves Canada has we need strong central policies that will not only put the people’s interest ahead of the petroleum industry’s, but that will also put Canada’s national interests ahead of the parochial interests of the provinces. That means forcing the oil industry to re-invest a much larger percentage of its profits into a massive development of the Alberta oil sands immediately. It also means a renegotiation of the current status quo that allows provinces to sell their resources outside of Canada without prior consideration of national needs forcing Canadians to live with artificially high energy costs. Many have argued that the latter suggestion would require a constitutional convention. So be it. Let’s have it. Radical change in the energy sector in Canada has occurred before when corporations have refused to act with responsibility or accountability. Quebec’s Liberal government under Jean Lesage nationalized hydro-electric power in the early 1960’s when the private producers were engaging in profiteering to such an extent that rates skyrocketed to the point where many poor people couldn’t afford heat in the winter. Dozens died each year. The word “nationalization” should not scare anyone. It’s not a bugaboo and it has many gradations. As a start we certainly need effective “regulation”. We’ve had price and wage controls before. Perhaps it is time to look at profit controls on the oil industry since our competition watchdogs have been so ineffective. Uuncontrolled energy costs are hurting people. And not only in the pocketbook. But in their very ability to survive. To earn a livelihood. I can anticipate the objections. Some will say that the moment the state introduces price regulation, shortages will appear. But there are no shortages of electricity, natural gas, or water even though the state does regulate their prices. The idea is not to fix artificially low prices by decree, but to analyze real costs of production, transportation, development and research, and on this basis set prices that would enable companies to profit but not to profiteer, as they now do, because of their lock-step policies and near-monopoly status. Government at all levels will have to be true partners in these reforms and reduce their untenable taxes even at the expense of Prime Minister Martin’s pledge to transfer some energy tax revenues to the cities.